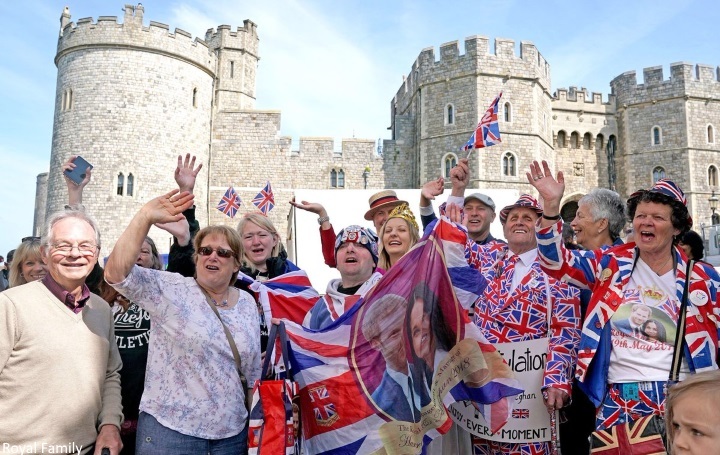 Mad About Meghan: LIVE BLOG: The Royal Wedding! 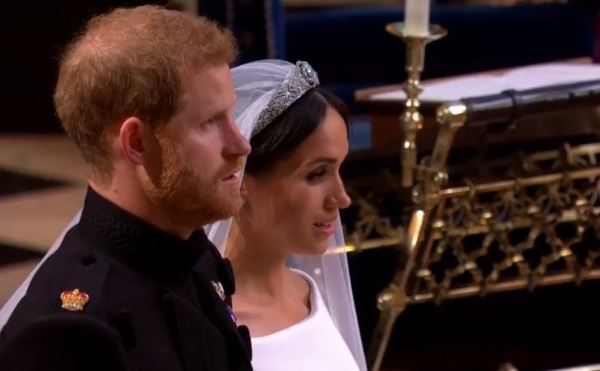 LIVE BLOG: The Royal Wedding! Hello and welcome to our Royal Wedding Live Blog. We'll be with you throughout the day, with the latest updates and photos as they emerge. The most recent updates will appear at the top of the page. Don't forget to hit the refresh button to see the latest news. The Royal Family Live Stream can be viewed here. Below, the PBS Live Stream. A fabulous image from the carriage procession. 13:05 - The happy couple. 13.00 - Singing God Save The Queen. 12:50 - Charles and Doria. 12:42 - Their Royal Highnesses The Duke and Duchess of Sussex. 12:40 - Husband and wife! 12:35 - The choir are singing Stand By Me. 12:25 - An arrival video of the bride. 12:20 - A stunning photo. 12:15 - What a moment. A selection of flora distinctive from every state member of the Commonwealth. The Bride is wearing earrings and bracelet made by Cartier. The Bride's bouquet is a petite design, pulled together in a gentle, ethereal, relaxed style with delicate blooms also including scented sweet peas, lily of the valley, astilbe, jasmine and astrantia, and sprigs of myrtle all bound with a naturally dyed, raw silk ribbon. The myrtle was first carried by Queen Victoria's eldest daughter, Princess Victoria, when she married in 1858. Ms. Markle's hair was styled by Serge Normant, with make-up by long-time friend and make-up artist Daniel Martin. Clare Waight Keller designed the six young Bridesmaids’ dresses in the Givenchy Haute Couture Atelier in Paris. 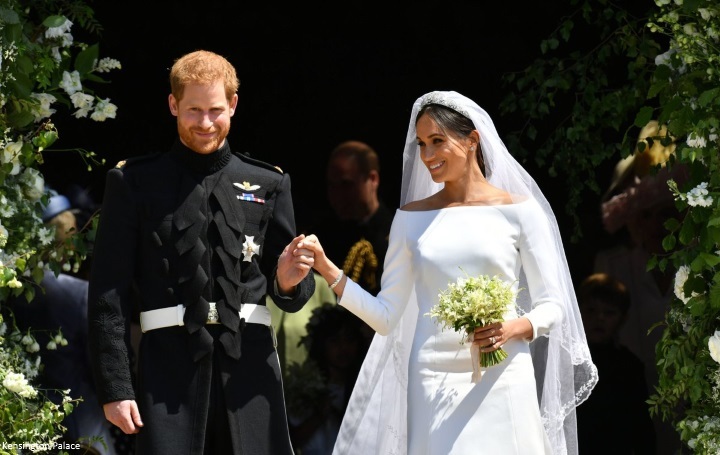 The dresses were designed to have the same timeless purity as Ms. Markle's dress. Each dress is sculpted in Ivory silk Radzimir, and is high-waisted with short puff sleeves and hand finished with a double silk ribbon detail tied at the back in a bow. The Bridesmaids’ dresses include pockets and pleated skirts to create a relaxed and luxurious silhouette. The Bridesmaids are wearing white leather Aquazurra shoes; each pair is monogrammed with the Bridesmaids initials, and the wedding date. The shoes are a gift from Ms. Markle to the young ladies as a keepsake of the special day. 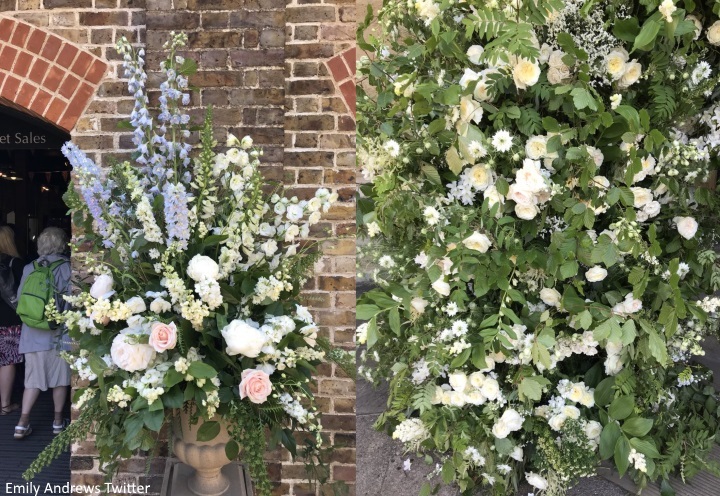 The bridesmaids each have flower crowns selected by Prince Harry and Ms. Markle, which have been designed by florist Philippa Craddock. The Bridesmaids' flowers replicate the flowers used in the bridal bouquet. The four Pages are wearing a miniature version of the Blues and Royals frockcoat. The uniform draws its insignia from the Blues and Royals, which is an old Regiment of The Duke of Cambridge and Prince Harry. Both are also wearing Blues and Royals frockcoats for the Wedding Day. The frockcoats are made from blue doeskin, single-breasted in style with a stand-up collar and completed with figured braiding of Regimental pattern. The figured braiding has been scaled down for the Pages, as otherwise it would have gone above their shoulders. As a special memento, each Page has their initials embroidered in gold on their shoulder straps. The Pages are not wearing hats or white waist belts for practical reasons. Their leg garments are made from blue/black wool barathea with three-quarter scarlet stripes fastened with a leather strap. Ms. Ragland wears a custom dress and day coat designed by creative directors of Oscar de la Renta, Fernando Garcia and Laura Kim. Ms. Ragland's shoes are designed by Edgardo Osorio of Aquazurra, and her custom hat was designed exclusively for her by British milliner Stephen Jones, O.B.E., whom Ms. Markle has worked closely with since moving to the UK. 12:05 - A high-res image of Meghan and Doria. 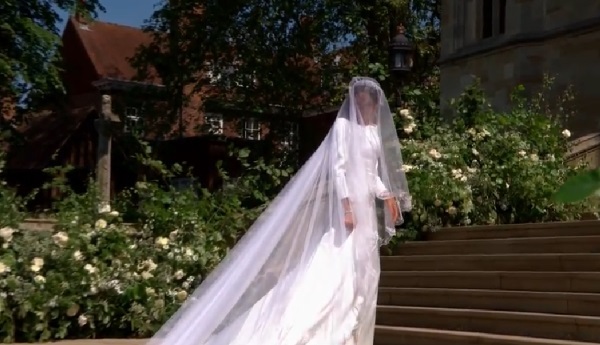 12.00 - The bride's gown is by Claire Waight Keller, artistic director for Givenchy. 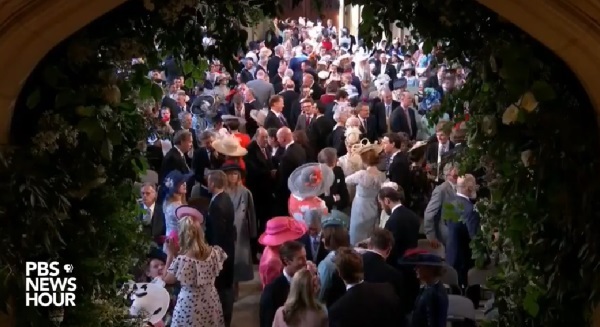 11.55 - The Queen, the Duke of Edinburgh, Prince Charles and the Duchess of Cornwall have arrived. 11.52 - The mother of the bride is radiant in green. 11.50 - Just a few more minutes Harry. 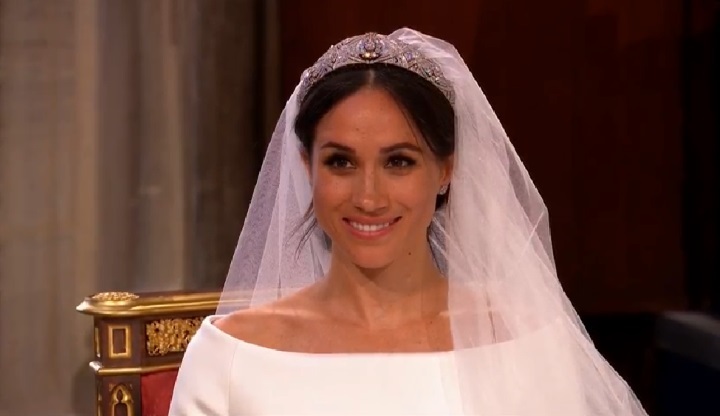 11.45 - It is thought Meghan is wearing Queen Mary's Filigree Tiara. 11.36 - The Groom and Best Man wearing their Blues and Royals uniforms. 11.35 - A better look at the bride wearing an updo and tiara. 11.30 - Members of the royal family. 11.05 - The Royal Family YouTube stream is live. I've added it to the top of the post. 11.03 - Sarah, Duchess of York. 11.00 - Members of the Suits cast are arriving. 10:56 - Meghan's close friend Priyanka Chopra. 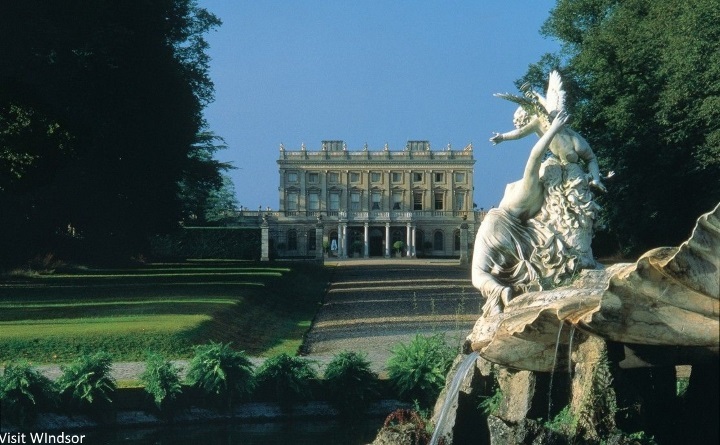 10:45 - Meghan and Doria will leave Cliveden at 11.15 a,. 10.25 - George and Amal Clooney. Amal looks stunning in Stella McCartney. 10:15 - The Middleton family arrive. Pippa is wearing The Fold Hepburn Dress (with thanks to Kate). 10.10 - Chelsy Davy arrives. 'Prince Harry and Ms. Meghan Markle have chosen Cleave and Company to make their wedding rings. Ms. Markle's ring has been fashioned from a piece of Welsh Gold, gifted by Her Majesty The Queen. Prince Harry's ring will be a platinum band with a textured finish. Both rings were crafted in the Cleave workshop. The rings will be carried to St George's Chapel on the day of the wedding by the Duke of Cambridge, in his capacity as Best Man. Established in London since 2001, Cleave and Company holds two Royal Warrants granted by Her Majesty The Queen and His Royal Highness The Prince of Wales. 10.00 - Idris Elba and Oprah arrival video. 09:53 - Oprah takes her seat. 09:51 - Diana's niece, Lady Kitty Spencer. 09:50 - Singer James Blunt. 09:45 - Oprah has arrived. 09:42 - Actor Idris Elba has arrived and Earl Spencer. 09:40 - The chapel doors are open and guests are starting to arrive. 09:35 - William and Harry have left Coworth Park in a convoy. 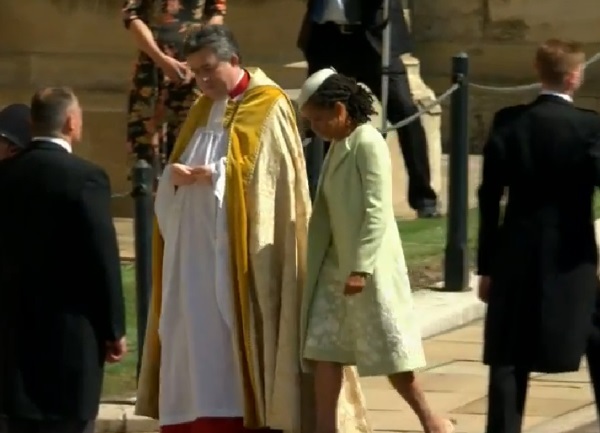 They are expected to meet family members before heading to St George's Chapel. 09:30 - A reminder of timings from The Sun. 09:20 - I've added the Washington Post Live Stream to the top of the blog. 09:20 - How fabulous does St George's look? 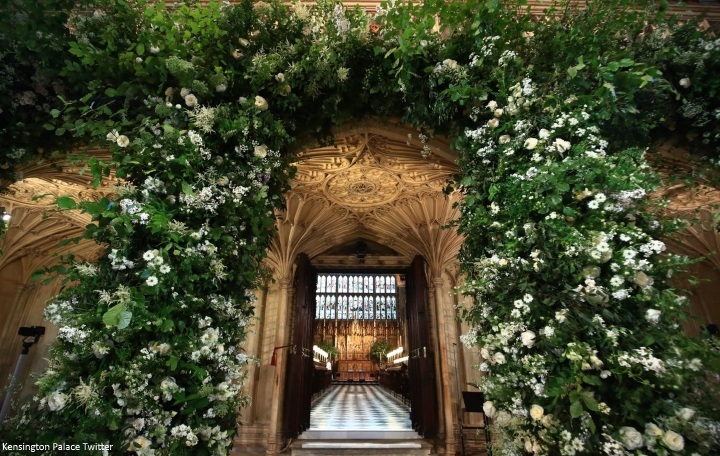 08-50 - ITV reports: "St George’s Chapel has been adorned with floral displays ahead of Prince Harry and Meghan Markle tying the knot. The first pictures from inside the historic building show foliage, white peonies, white garden roses and other white blooms adorning the front of the organ loft, towering above the seats. A central arch will serve to frame the royal couple as a congregation of family, friends and well-wishers watch them take their vows. Two large arrangements also sit either side of the High Altar in the Windsor Castle chapel. 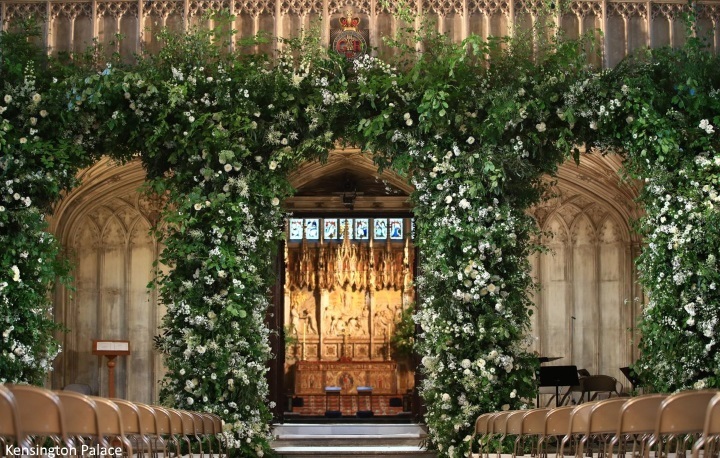 The display, which also features foxgloves with branches of beech, birch and hornbeam, also extends to outside the chapel, lining the West Steps and surrounding the West Door through which Meghan will enter the church." 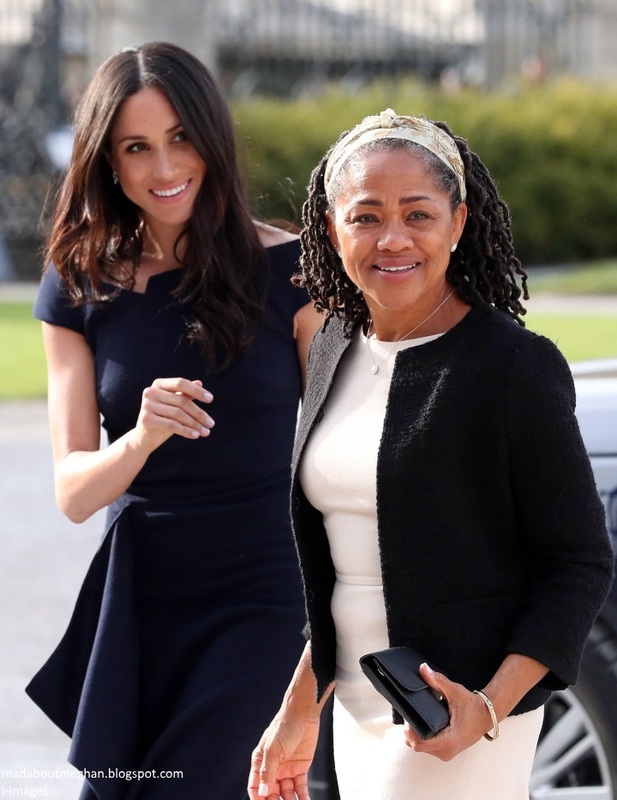 09:00 - Meghan and her mother Doria are currently at Cliveden House Hotel. I imagine Meghan is having her hair and make up done as we speak. Sky reports we should see them leaving just after 11 am. 08:46 - Take a look at this. In just over three hours Meghan will walk up these steps. 08:45 - Flowers adorn the walls of St George's Chapel. 08:35 - The scenes at Windsor this morning. Royal fans have been waiting for days. 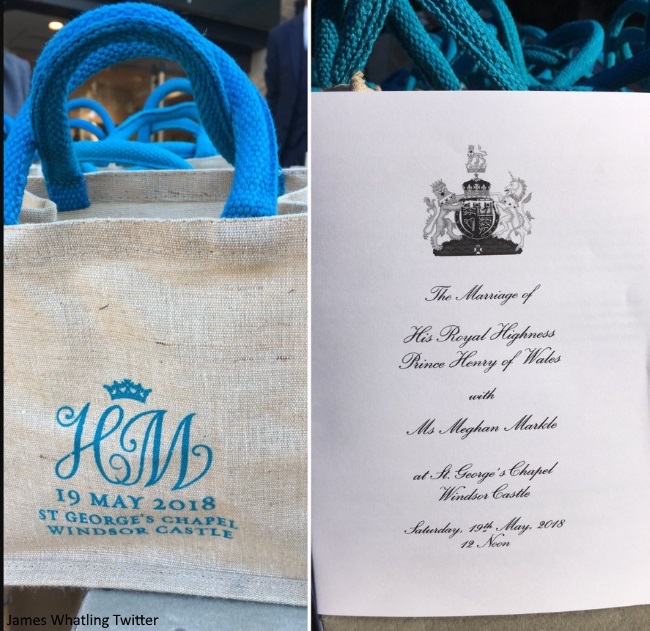 08:30 - A selection of bags filled with water and Harry and Meghan chocolate coins waiting for guests. 08:15 - His Royal Highness The Duke of Sussex and Her Royal Highness The Duchess of Sussex. 08:05 - The full Order of Service is available to download here. 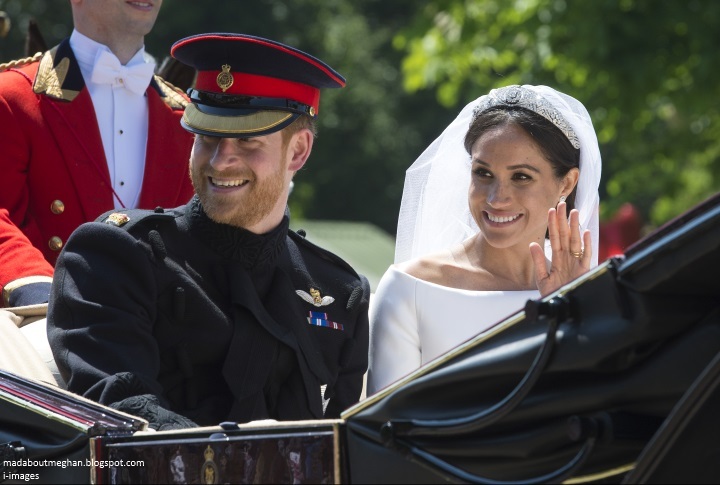 The Palace said: "Like any couple getting married, Prince Harry and Ms. Markle have taken a great deal of care in selecting all elements for their service. This has been a collaborative effort led by Prince Harry and Ms. Markle. They have also sought the advice of The Prince of Wales for the orchestral music before the Service begins." 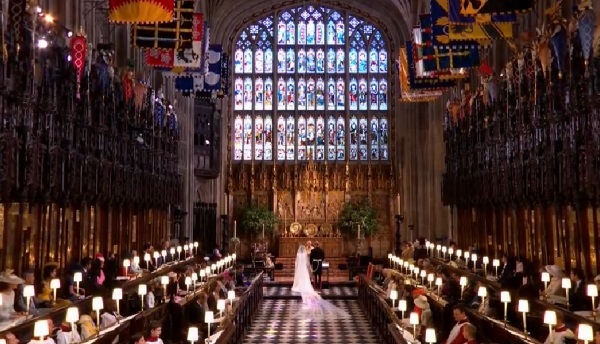 'When Meghan Markle enters St George’s Chapel to begin the last steps in her journey to join the Royal family today, the state trumpeters will sound a fanfare that has accompanied its brides for generations. We can look forward to these vows later today. The Order of Service confirms Prince Harry will wear a wedding ring. 07:45 - Good morning dear readers! Today's the day when Harry and Meghan will say "I do" in front of their nearest and dearest at St George's Chapel. Meghan's currently at Cliveden with her mother Doria. We have a very special and memorable day ahead. I am so ecxited ☺ I'm at a family reunion, but luckily my aunt is also very ecxited, so we're making an event out of watching the wedding. Good thing, since I considered not going to the reunion to warch wit all my girlfriends. Wishing you all a magnificent day! Maybe, Kate in blue (J. Packham or A. McQUeen) and the Queen on purple. Wedding Dress: Ralph & Russo. Well Karolina, she can't go wrong if she follows your designs & styling predictions! Your predictions sound Lovely! Good morning Charlotte! 3 a.m. here on the East Coast across the pond and I can't sleep! I know it's anticipation - this happens whenever I am planning a trip, have a big appointment, etc. Do I watch your SkyNews live feed or try to catch a few hours sleep? Thanks for being up and at 'em. Exciting day ahead! Good morning Anna! Glad to know other crazies on the east coast are up this early for all the excitement! Good morning everyone! 3:04 am EST and I couldn't sleep any longer. Soooooo excited! 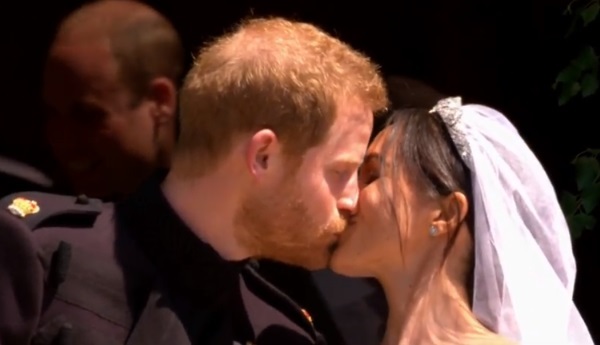 I'm watching Harry & Meghan: A Very Modern Romance on BBC America right now to get in the mood (as if I needed anything else to get into the mood, lol). My predictions for the day: Meghan will wear a dress by by Phillipa Lepley and the Queen Mary Fringe tiara (my dream scenarios). Harry will wear his new Royal Marines ceremonial uniform. 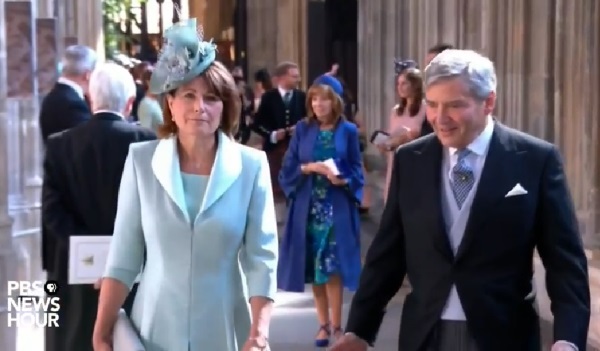 And, they will exit the church as TRH, The Duke and Duchess of Ross. After reading through the order of service that was published at midnight, I was so pleased to see confirmation that Harry WILL wear a ring. Yay! Chat soon, my lovelies. Can't wait for the party to begin!! Good morning Charlotte! Thank you for bringing this very special day to your readers through your live blog. I'm looking forward to your wonderful and insightful updates, interpretations and comments about what will certainly be a very long yet rewarding day for you. I can't wait to see it all unfold! OH! As I was typling, the titles announcement was made. I was wrong...the much expected Sussex it is! 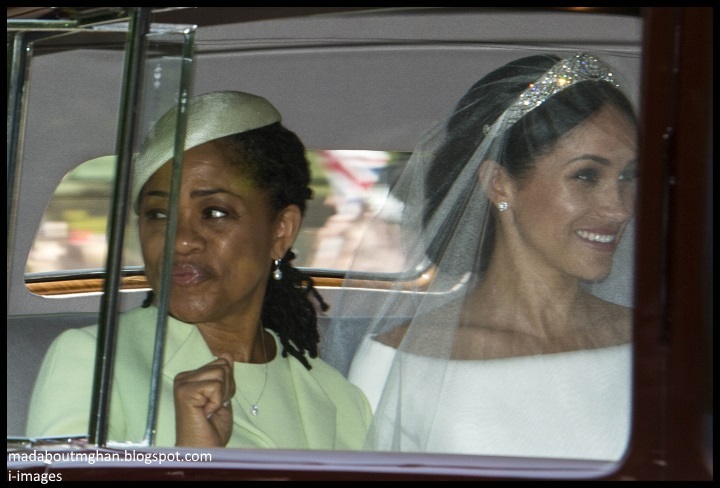 her mom looks lovely and meghan stunning what a beautiful moment thank you Charlotte. @Sharyn from AUS - Yes, such a nice history, isn't it?! And, Meghan will be the very first Duchess of Sussex. I love that! I wasn't a fan of Sussex before learning that history, mostly because saying 'Duchess of Sussex' out loud is a bit of a tongue twister...but I'm a fan now, after learning about the original Duke of Sussex. Oh my! This will be the last royal wedding in a long long time! I will enjoy every minute of this. What a party this will be! Thank you so much for your Blog, Charlotte! yes surfer girl, but will they have the same level of pomp and pageantry, or even media interest? Surfer girl, it will help, but what will we do after that? Wait, I'm confused! I thought Eugenie & Jack's Wedding is to be in October? Duke of Sussex. I was really hoping for Windsor. I know the feelings about that but it would have been great for the most popular prince and his very popular new wife to change the ill feelings surrounding that title. I don't think Windsor would have happened because too easy for the media to draw comparisons: a divorced American entering the royal family. Also, the queen's father (and by extension, the queen) were quite hurt by the abdication and the impact on the family. It may have been many years ago to the public, but possibly too soon for her majesty? Duke of Windsor will be serious distraction and comparisons with late holder considering he married a twice divorced woman and abdicated on that ground. This title is perfect considering the tweet that the last duke of Sussex campaigned for the abolition of slavery. Wonderful news about Harry's dukedom! 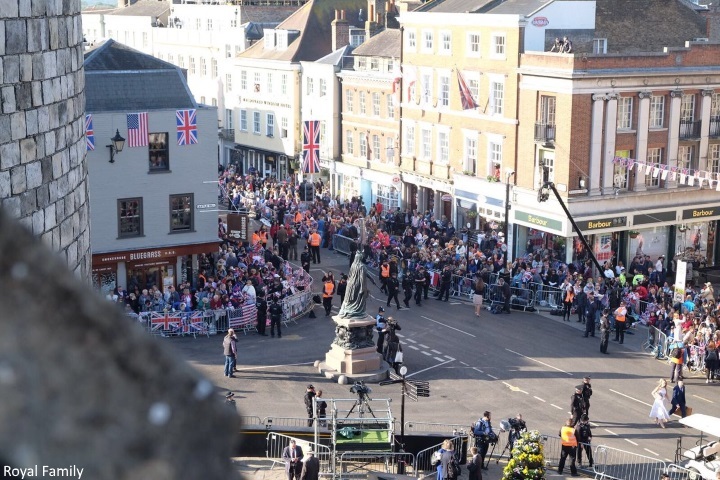 The atmosphere looks to be electric in Windsor and it is going to be a beautiful sunny day. I will be checking in to the blog regularly but I think the toughest part of today is going to be holding back the tears thinking about Diana. I know that she must be looking down on Harry and Meghan today and beaming with pride! Congratulations Harry and Meghan! Here's wishing you both a lifetime of happiness and love :) You both deserve it, cheers! Hallo! Good morning everybody! Finally here we are! I'm already with BBC. If I don't understand wrong they're saying that Harry and Meghan will be the Duke and Duchess of Sussex! Congratulazioni! Okay...yep, the tears have started already, lol. As a biracial American woman myself (and married to a white brit! ), today feels so meaningful for me. A milestone I never thought I'd see in my lifetime...le sigh. Happy times. That’s beautiful. I bet this is such a special day for you! How amazing that the Duke of Sussex campaigned against slavery? I had no idea about that history when I heard the name suggested. What a special and meaningful day for Meghan and the whole monarchy. Well there we have it, finally - Duke of Sussex, Earl of Dumbarton and Baron Kilkeel. Now that has a nice ring to it! I love that Harry will also wear a ring, unlike William. It's great that they've released the order of service, so that everyone can be part of it, no matter where they are. 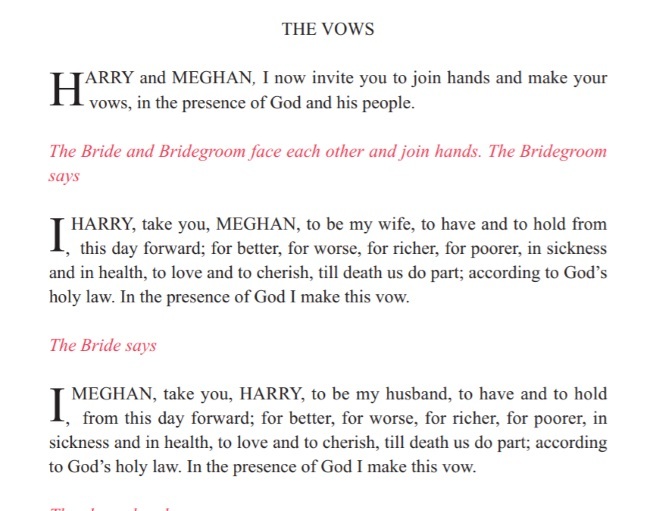 The service sounds like a wonderful blend of the traditional and modern - good for Harry and Meghan. I'm sure it's going to be a truly joyful day! 🌸 coat of arms yet? not yet. Do we remember when Kate (well, her dad) got the Middleton coat of arms? was it the day of the wedding? Wow, Janey! Lucky you! 😀Enjoy at the atmosphere, that's definitely one of the best things about today and one which you won't forget! Lucky lady . Good for you! Doris in Pale Mint Green Lovely!!! Oh Camilla is lovely in Pale Pink! 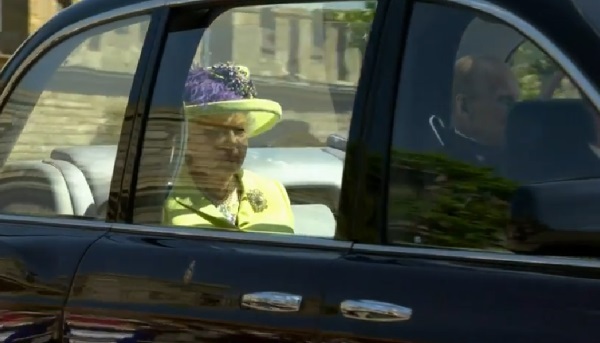 Ohhh The Queen in Bright Light Green & Prince Phillip!!! So So Great To See Him!!!! He’s Amazing!!!! Watching the Sky coverage at my house right now and thrilled Harry will wear a ring!!! How romantic of him?! Also, CANNOT wait to see the gown! A warm and happy good morning to all the MAM (and DKB) clan. Presently 12:40 AM in Victoria, British Columbia, I've awakened after a 4-hour nap, made coffee, perused the post so far, printed the order of service, and am about to sort out a live feed on one or more of the broadcasting networks. Alas, Skynews links, are not made available in this area. Many, many thanks, Charlotte for your exemplary blogging on both MAM and DKB. How do you manage your thoughtful, respectful, insightful and detailed commentary at the pace that you've been keeping of late? You are a miracle of love and light. So lovely to share the Order of Service ahead of the ceremony this way. So looking forward to the pomp and pageantry the Brits do so brilliantly along with those personal touches brought to the service by Meghan and Harry. One of the commentators yesterday who had seen the Order of Service yesterday (but was sworn to secrecy) gave a little hint: It has soul! she said. Indeed. Wishing all of you who share this day with me here a Blessed One. Welcome Philly! Excited to share this special day “with” you!! Thank you for providing the Sky Livestream. It works for me in Germany as well. The television coverage in Germany starts in one hour, so I would miss the atmosphere beforehand. And I liked to have a look at the Order of Service. OMG...just a couple of minutes now until the guests begin arriving. So excited! Who will be first? Who will be invited? Let's get this show on the road! Ohhh, Oprah arrived & is trying to find her seat! Why am I surprised, but I am? Oh Quick Tally Ho To Those I Can See & Know are Here Already! I am going to apologise in advance to everyone. for some reason I can't post comments as Sharyn from AUS using my laptop, so am using my phone. But typing on a liytle screen while in excited = spelling errors. It’s not even 4am here and I’m up and excited! My. I’m and I have scones and clotted cream and tea and little crown napkin rings! I’m delighted with the titles—how thrilling to be the Duchess of Sussex!! And I love that Harry ever the romantic is wearing a ring. I’m just beside myself. Good morning Charlotte! Very excited down here in NZ. 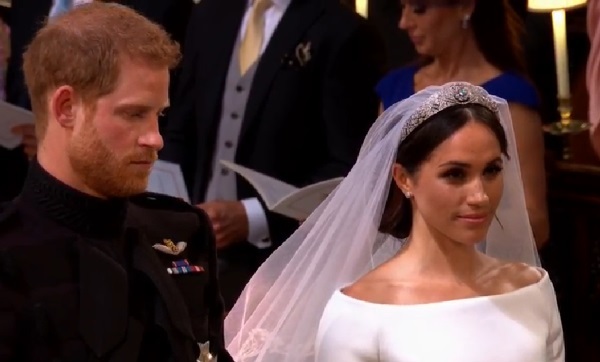 Oh, The Duke & Duchess of Sussex!! Yes! 🌸 The Order of Service is a beautiful ceremony. 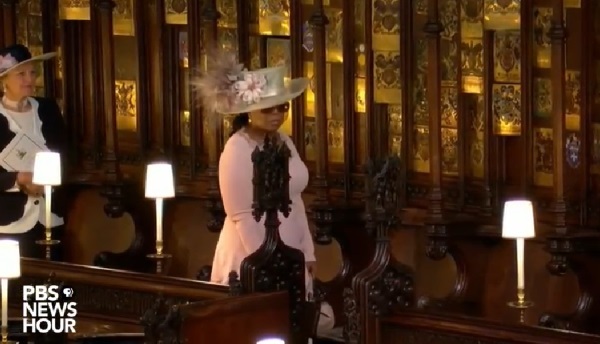 And, everyone is saying Meghan is being a feminist walking up the aisle by herself. 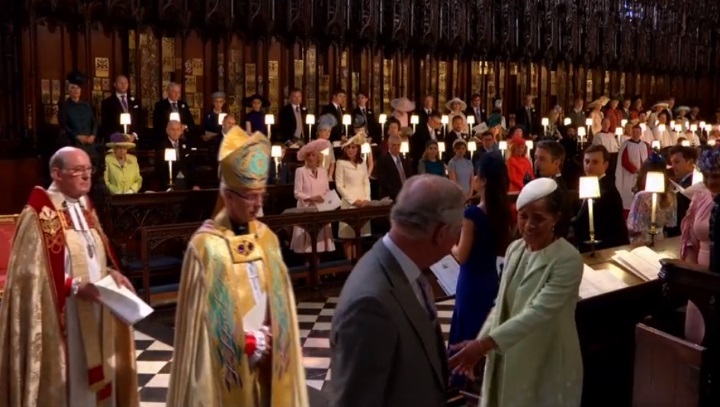 But the heritage of that is that a man who joined that clergy there would walk up that one part by himself then (where Charles is meeting Meghan) a senior clergy would meet the novice and accompany him to the alter to take his vows. When met at the “Charle’s” meeting place it was a symbol that he was first alone but now a member of that body of clergy. This is SO exciting!! I'm happy the weather is so beautiful. It really is an extra bonus! Sky News coverage is very good I think. They have their reporters in excellent locations. 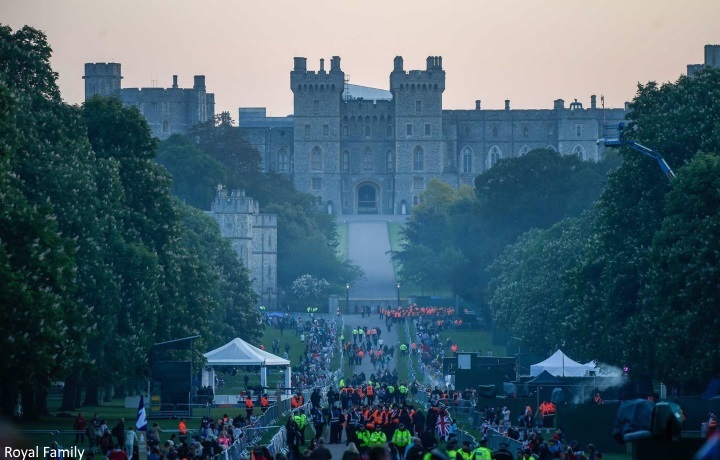 How exciting that the car with Meghan and her Mum is going to arrive via the Long Walk so all the people there will be able to get a glimpse of Meghan en route!! 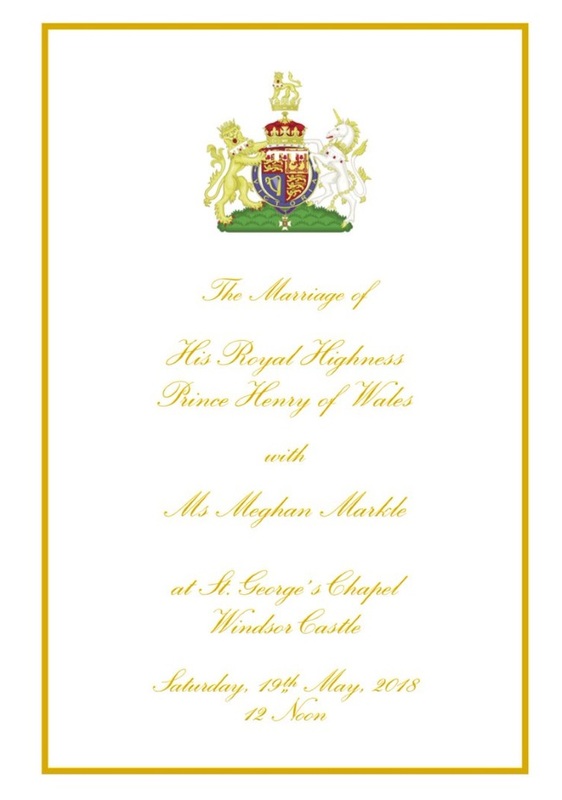 What I most look forward to is all the guests coming into the Chapel, with HM just moments before Meghan and her Mum, and then the trumpet fanfare playing...! I'm gonna cry and cry, I know! It feels surreal just to watch the live coverage. Now imagine being there! OMG. Good morning, Charlotte and everyone. Good morning, all. What an exciting day! I have been hearing rumors that the dress is by British designer Clare Waight Keller from House of Givenchy. I'd not heard that one before. In any event we will know in a little bit. I'm so excited for today, although sigh, Prince Harry will now be taken hehe. I too found it so romantic that he's going to wear a wedding band, almost bought yet another onslaught of hormonal tears haha. I've forced my poor husband to sit with me tonight and watch the wedding, and he's prepared scones and pastries for supper for us to indulge in! The best treat for this heavily, heavily pregnant lady. I had a stern talking to at the bump and reminded her to stay in until after I've seen the wedding HAHA!! Will she have a Coat of arms? I'm dressed in Burberry today. Maybe this si my unconscious prediction. I started commenting this morning on the other post - I am so glad, it´s finally here, this day! I have finished the ironing (see last post comments, lol), cleaned everything - so I´m ready to go!!! YAY!!! I must admit I personally would have liked more colour with the flowers. I absolutely ADORED the colourful arrangements at CP Mary of Denmark´s wedding, designed by no other than HM The Queen of Denmark herself!! Duke and Duchess of Sussex - so there we go!!!! Harry will wear a ring - HOORAY!!! They have a slightly changed vow wording. The last sentence is more modern than the one used before. It will be SO moving. And then "Stand by me" - I well up just thinking of this song - let alone hear it performed!!! What a hymn, what a powerful message for both of them!! Ahh, half an hour to go until the coverage is starting here in Germany!!! YAY!! THANKS SO MUCH, Charlotte, you´re doing a stellar job each and every time, I feel PRIVILEGED to be able to follow your coverage today!!! Thank you isn´t enough!! Hugs from Germany!! Did anyone notice that apparently they are NOT going to say their full names? Just "I, Harry" and "I, Meghan"? Now THAT´S a royal FIRST!! It's show time! 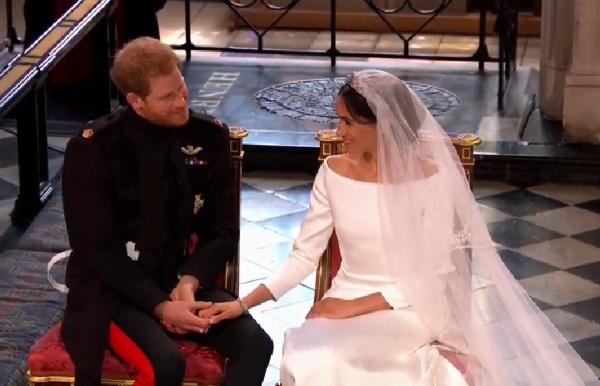 Very happy for Harry and Meghan. The excitement is palpable and Harry looked absolutely ecstatic yesterday. He was nust brimming with joy and I confess I got a bit misty. I've always had a soft spot fornhim and it's just.lovely to see him so happy. Meghan is lucky to be so loved. It's 130am here in Washington state and I'm very much looking forward to the day. Rebecca Deacon in a red dress?! I feel for those of you who are up at the crack of dawn to watch - my day has dragged in anticipation, but at least I got a full nights sleep! Thanks for posting the washington post stream Charlotte, I can watch that one as I wait for the news to finish and tv coverage to start here. I've cracked open the bottle of wine and after an early dinner I have no reason to leave the couch! Good morning everyone! I love watching the guests arrive. I can't wait to see Kate, and of course Meghan. Hello Everyone! It is 3.55 am CST in the US. 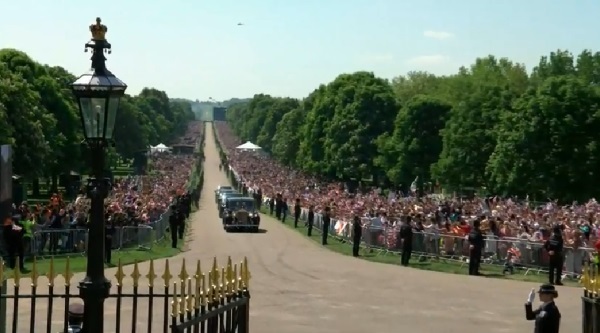 I can just feel the excitement in Windsor from the livestream. So wish I could be there! 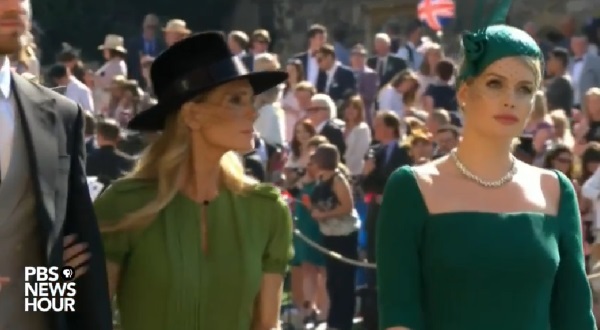 I just saw the Middleton's arrive and Carol looks beautiful, as does Pippa. No surprise there. The Middleton ladies look very elegant! Good morning Becca. 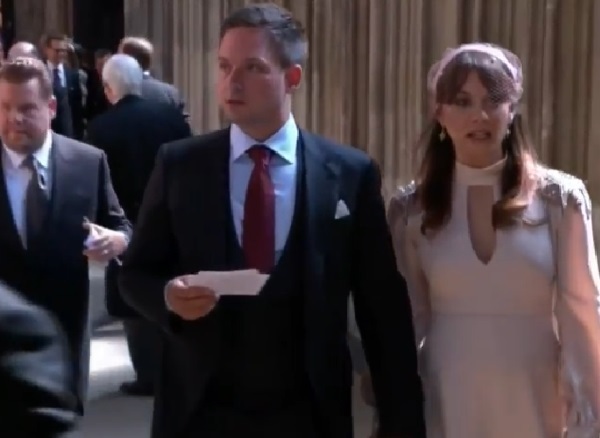 Carol's dress looks like the pink version of the one she wore for Pippa's wedding ... Imo. I'm absolutely loving all the outfits and hats! Pippa looks lovely. And I see George and Amal Clooney just showed up. This is so fun to watch. Checking in with my 11 year old daughter, Emma Jean! So excited! 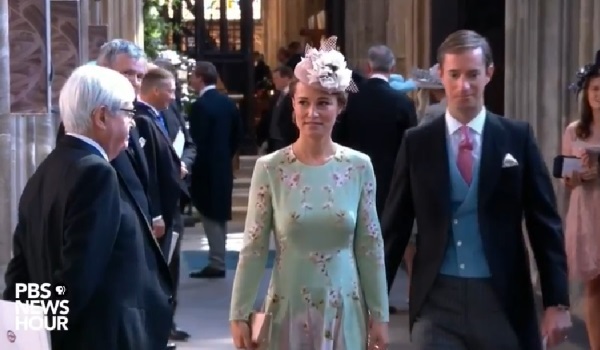 Pippa looks beautiful I love her dress + hat! Carole looks fabulous and Pippa has beautiful dress.I 'm glad to see family of Kate.Wedding is occassion to invite a big family. Also, Carole's hat is gorgeous. Oprah... well, that outfit looks horrible. There's no way to sugarcoat it. Good morning all, The big day has arrived 🙂 I like Oprah's hat. Hello all! Woken at 2am by my baby...perfect timing! Not down watching the tv coverage, still on the PBS livestream for now. So excited! Amal Clooney looks amazing as usual! I love what Amal is wearing. We're watching from Cape Town, South Africa. This is so exciting. Are there screens up for the majority of guests not in the front part pf tue church to witness the ceremony? Also, so many amazingly dressed guests! But I have no idea who they are! 🌸 Will Cressida be there? Wish the CNN commenters would stop gabbing and tell us who is arriving. Victoria Arbiter knows who the people are. Pippa was showing a bit. So good to see Michael. Eager to see Phillip also. Cressida is there! She arrived very early. Try the BBC station if you have it. Good morning SG ! 🌞 PBS has the same coverage as BBC America... Without the commercials. SG, they said on German tv there will be TWO ex-girl-friends!! Hi everyone. It's 2:45 in the morning here in Tempe, AZ. I need more coffee! I'm watching the festivities on the Royal Channel. I started watching on one of our networks but hated all of the commentators. LOL. So I switched to the Royal Channel and came to the blog for the news on who is who! Thanks Charlotte! I also love Amal's hat and Oprah's dress. It was a surprise to see Oprah there, wasn't it? My guess would be Stella McCartney for Meghan's dress, McQueen and a shade of blue for Kate, pale pink for the Queen. Good morning, happy wedding day, and happy birthday to me!!! I’ve never been up so early on my birthday before (it’s 5:50am here) but it’s totally worth it! Thanks Harry and Meghan for marrying on such an important day, lol. Good morning everyone. What fun this is! I have a full teapot and breakfast going . . . How beautiful everything looks! Wish I were there! 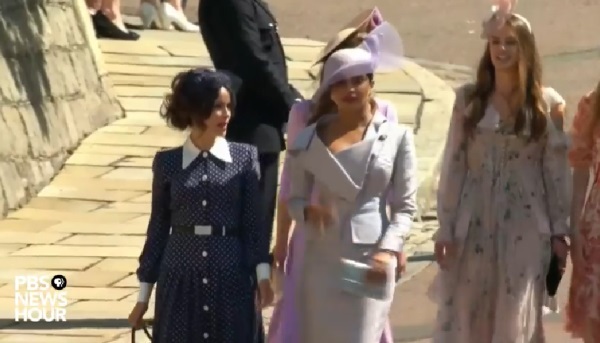 The woman next to Priyanka is Abigail Spencer. She too featured in Suits. Loving BBC America coverage with my FAVORITE Kirsty Young (ala Desert Island Discs). This is so exciting!! I heard that Harry's cousins were not invited. I am assuming this is 2nd and 3rd cousins, and his 1st cousins will be there? Eve, this is not what I expected! Me thinks you have won the bet! 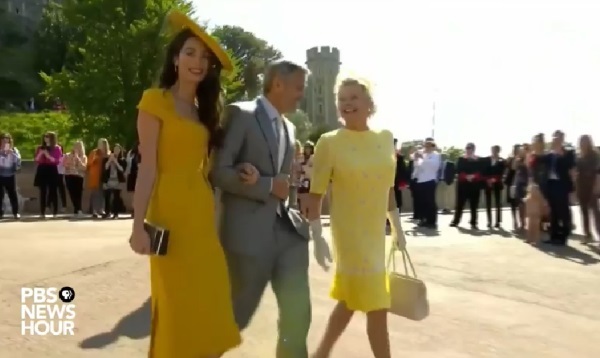 So funny watching George Clooney & James Corden Yucking it up at The Royal Wedding! lol :) It's intriguing seeing the various groups of friends hanging out & chatting, there are Harry's old chums & gals, there are the Suits cast, there are the gaggle of US Celebrities & Friends with Serena joking with James Corden & Amal Clooney as also with Priyanka Chopra & others chatting. Can’t wait to see her dress! A Windsor connection: the country dance that plays along as counterpoint to Greensleeves in the Holst suite that is being played before the ceremony in called Gathering Peascods. The road that goes away downhill in front of Queen Victoria's statue outside the castle is called Peascod Street, because of its shape. OH! Is it a tiara? Hands down, Lady Kitty Spencer wins the award for the best dressed guest. Big time!! I love every single detail of her outfit! 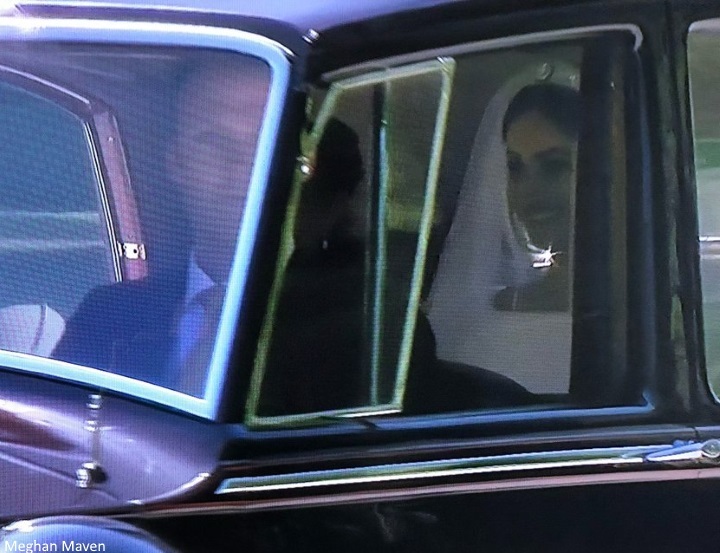 Meghan is wearing veil and tiara! There’s a boat neck!!! It was my dream for her! And a very subtle tiara. Looks like she’s gone clean and classic!!!! Jenna checking in from California. Meghan looks stunning! I'm teary already!!! Oh, we just got a glimpse of Meghan and her Mum in the Rolls-Royce! She seems to be wearing a tiara I think! I bet we're so all excited!!!! And all the RF members - lovely to see!!!!!! Hi everyone! I just now started watching! It is 4:23 in Colorado! I love that Oprah is there and the Clooneys and Sarah Ferguson! 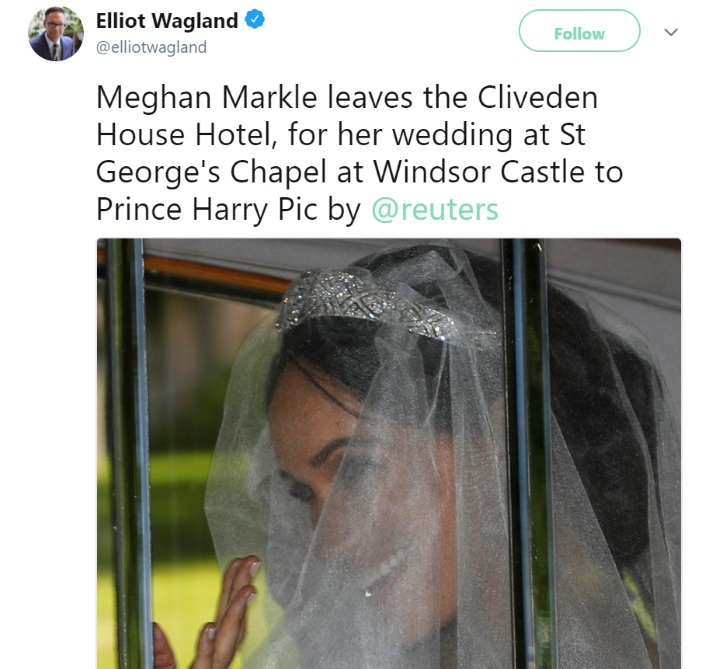 Oh, Meghan left the hotel! She is wearing a smallish tiara and a veil, though not a blusher. Yeah! Lady Louise looks lovely (and how alliterative!). Beatrice and Eugenie in very restrained headgear this time! OMG!!! Just saw her leaving and on first tiny glimpse it looks a bit Jackie O?? Classic!! 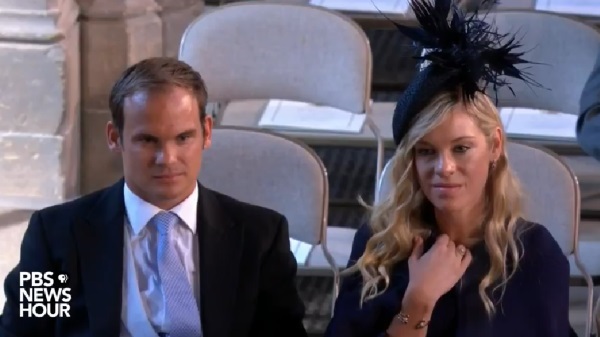 Beatrice is sitting to his right, I think Kate will sit to his left. I'm so excited! Woke up with my little daughter at 6am, we have our sparkling punk lemonade and donuts, TV coverage, and of course Charlotte's live blog- the best source of info! 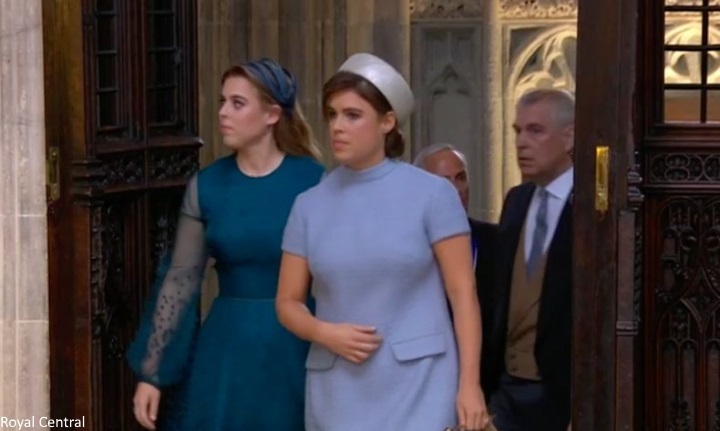 I'm surprised about how sedate Beatrice and Eugenie look. Glad Duchess of York made it in before the doors closed! Stunning! Im so excited to see the full dress and the Duchess to arrive! Looks like the Strathmore Rose tiara in this picture. What do you all think? Good Morning all!!! It’s the big day - finally. 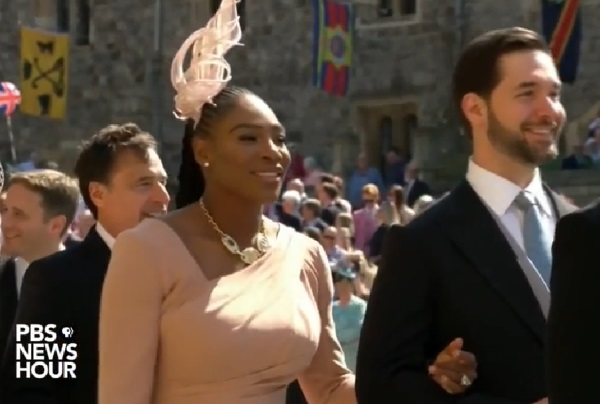 Just soaking it all in and I think my prediction may be true - I think she is wearing the Dpencer Tiara. What a lovely nod to Diana!! Can’t wait to see Harry, Wills and Kate!! OMG the York sisters look fabulous - nothing remotely weird! Also Lady Louise is soooo cute! She is getting to be quite the young lady!! I LOVE LOVE LOVE her choice of tirara. I expected exactly this one. Her dress' neckline is SOOOO beautiful too. Not sure, but it could be the Teck Crescent Tiara. William looks much more relaxed than his brother! How odd to be cheered by crowds on your walk to your wedding! Prince Harry is looking very nice in his Uniform. I like the Uniform Choice. Based on the photo Charlotte just posted, I am so wrong - not the Spencer Tiara. She looks beautiful!!! OMG !It 's only a few minutes to see Meghan!!! I prefer the uniform William wore to this one, but Harry still looks great! Nervous, though! No, looks like a new tiara! Looks like its Queen Mary's filigrane tiara. 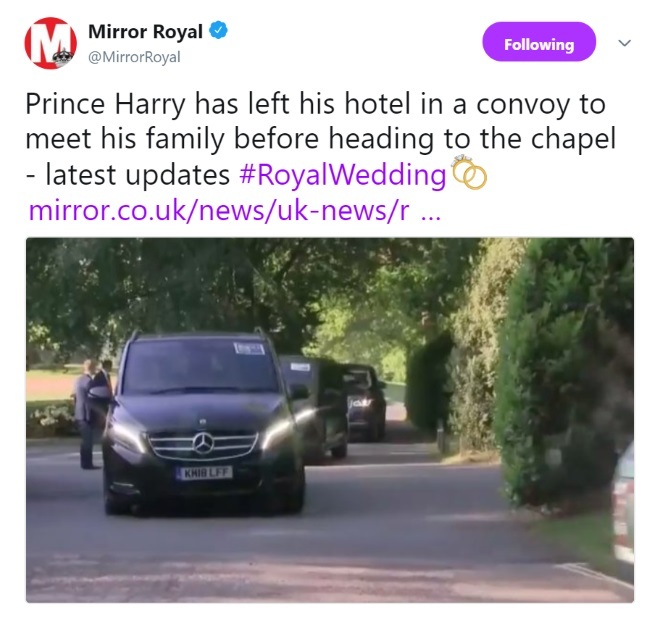 Meghan's Mirror says it is the Queen Mary's Filigree Tiara ??? 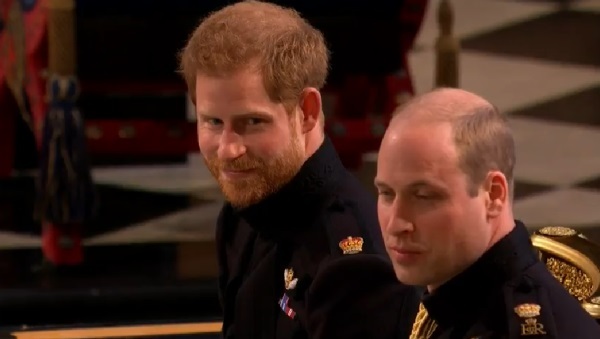 Does anyone know why both Harry´s and WIlliam´s uniforms are quite "unadorned" today, compared to William´s wedding, when Harry wore "full bling"? Wow, Doria, extra-chic! Plus Mehgan´s favourite hat in a new colour!! She must REALLY love this style! ;-)) lol!! I'm so excited and so nervous! I wasn't this nervous for my own wedding, haha. LOVE HM´s colours!!! WOnderful to see Prince Philip!!! Wow!! Prince Philip walking as if he never had a hip surgery! And Doria fighting the tears.... so sweet!!! I´d cry, too! !